Below we have answered many common questions about the Partners in Progress Plan. If you have a question that is not addressed here, please don’t hesitate to Contact Us. What is Partners in Progress? Partners in Progress is a bold six-year program to stimulate economic and community development in Catoosa, Chattooga, Dade and Walker counties. The program grew out of a Strategic Plan developed by corporate and community leaders from across Northwest Georgia. Who is leading the Partners in Progress fundraising campaign? The fundraising campaign is led by a board of directors, headed up by Chairman Emerson Russell (ERMC). Is Partners in Progress affiliated with any other organization? Partners in Progress is sponsored by the Northwest Georgia Joint Development Authority. Its Board of Directors includes many public and private leaders throughout the Northwest Georgia area. How is Partners in Progress funded? Partners in Progress is underwritten by a community-wide fundraising initiative. What does the Partners in Progress Strategic Plan include? How much should we pledge? Each pledge request for Partners in Progress has been carefully considered and evaluated. A volunteer will contact you to arrange an appointment to answer any questions you have about Partners in Progress and to discuss your investment in this important program. How was the amount of our pledge determined? A select committee of corporate and community leaders representing all business sectors in the Northwest Georgia area carefully determined each pledge request in Partners in Progress. This Campaign Evaluation Committee considered the financial capacity of each corporate prospect as well as their leadership position in our community before suggesting a target pledge request. Is our investment in Partners in Progress tax deductible? An investment in Partners in Progress may be tax deductible as a trade/ business expense. 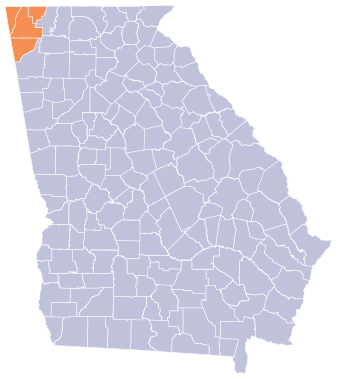 The Northwest Georgia Joint Development Authority is partnered with the Top of Georgia, a 501(c)(3) organization. However, you should contact your tax professional for specific information and advice. Who benefits from the Partners in Progress initiative? Every business, every professional, and every citizen in Northwest Georgia benefits. Economic development has a positive impact across the entire four-county region. Expansions of existing business and industry, new entrepreneurial opportunities, as well as new business and industry create hundreds of new jobs, millions in new capital investments, millions in new and expanded payrolls and millions in new tax revenues. Will we be kept informed of the progress and achievements of Partners in Progress? Yes. The Northwest Georgia Joint Development Authority generates frequent newsletters and an annual “report card” that measures its progress in the accomplishment of the goals and objectives of Partners in Progress. Will we receive recognition of our investment in Partners in Progress? Yes. At the conclusion of the Partners in Progress campaign, an Honor Roll of Investors will be published in the local newspaper and a plaque erected at the Northwest Georgia Joint Development Authority headquarters to honor all who are sponsoring this extraordinary initiative. Is economic development only concerned with bringing new business and industry to Northwest Georgia? No. National research confirms that as many as 70% of the new jobs in a community are created by existing business and industry. A key component of Partners in Progress is to assist Northwest Georgia’s existing businesses to grow and prosper.